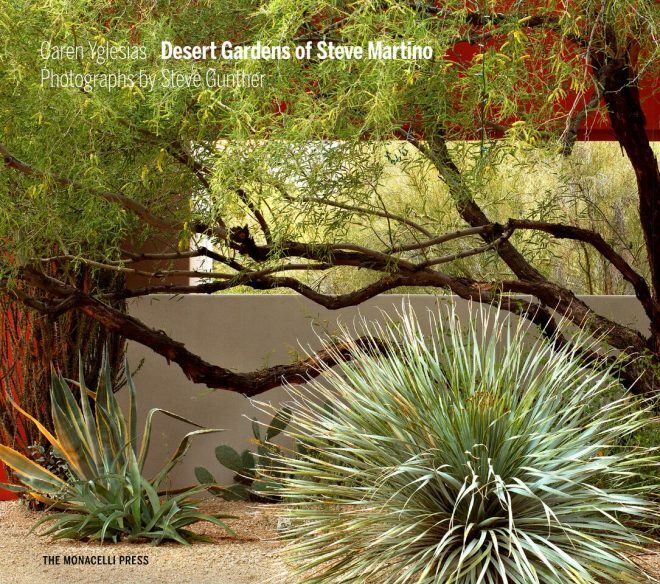 In Desert Gardens of Steve Martino you’re introduced to his work through the words of the book’s author, then a lifelong friend writes a short forward, finally Martino himself takes over in a chapter titled “Weeds and Walls: Epiphanies and Lessons Learned.” After that all-to-brief primer, you turn the page to jaw-droppingly beautiful garden profiles, 21 of them. Each profile features multiple photographs, a site plan, and a thorough description of the garden. Martino began his studies with the goal of becoming an architect, but the space outside kept calling to him. He became frustrated with costly projects, which solved none of the problems the location presented. After dropping out of architecture school he took on a series of jobs such as draftsmen for a design build firm, site developer, and eventually nursery laborer. Thankfully he eventually struck out on his own and started a landscape business. Although Martino later became a licensed landscape architect, he was not trained to think like one. He never learned to use the “approved” plant palette of Phoenix, instead he continued to search out those desert plants he saw thriving with little human intervention. Martino’s desire to create privacy for the inhabitants of the gardens he designs plays a significant role in his work. Colorful walls inspired by the work of Luis Barragán have become as much his signature as the plants he has made popular. Unfortunately, there is no date given for when Martino completed each project profiled in the book, so the reader is left wondering if you’re enjoying a chronological catalogue of his work, or a “best of collection” in an order determined by the author. That’s a short-lived concern however, as you quickly become immersed in the designs and find yourself dreaming about how to incorporate details into your own garden, be it in the desert, a rainforest, or a small urban lot in Portland, Oregon.